The Light Position node is the actual light source interacting with all the defined volume objects. You can set its position in relation to the objects and animate it over time. All volumes will react according to the light's motion. This is not where you set the light type or colour. 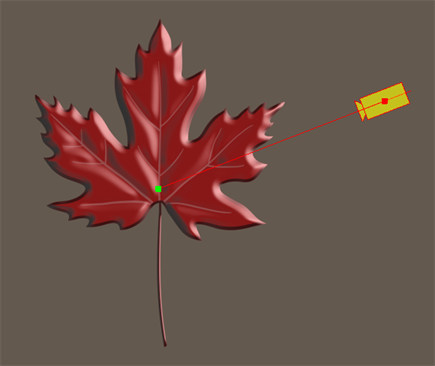 You'll be adjusting these in the Light Shader and Tone Shader nodes. Source Lets you control the value of the light source. 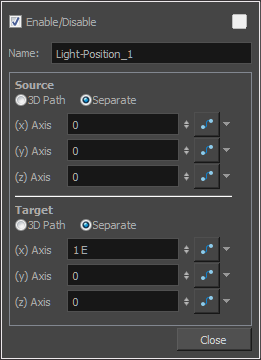 3D Path: Lets you use a 3D path when animating the light. Separate: Lets you enter separate values for the X, Y and Z axes. (y) Axis: Lets you type in a new North/South coordinate corresponding to the desired position. (z) Axis: Lets you type in a new Forward/Backward coordinate corresponding to the desired position.